The biblical purpose of the incarnation was to make possible penal substitution. The incarnation was the Lord’s identification with fallen man by taking on the form of a man in order that He might make propitiation for the sins of the people. “Therefore, since the children share in flesh and blood, He Himself likewise also partook of the same, that through death He might render powerless him who had the power of death, that is, the devil, and might free those who through fear of death were subject to slavery all their lives. For assuredly He does not give help to angels, but He gives help to the descendent of Abraham. Therefore, He had to be made like His brethren in all things, so that He might become a merciful and faithful high priest in things pertaining to God, to make propitiation for the sins of the people. For since He Himself was tempted in that which He has suffered, He is able to come to the aid of those who are tempted” (Hebrews 2:14-18). So if the incarnation was the Lord’s identification with fallen man, then what was the purpose of the baptism of Jesus? You, like me, have probably heard or read that the baptism of Jesus was His identification with fallen man – but that simply is not a true and correct interpretation of that event. And since the baptism that John (the Baptist) was performing was a baptism of repentance, surely, Jesus’ baptism was for another reason because He had no sin and no need to repent. So again I ask, what was the purpose of the baptism of Jesus? The baptism of Jesus was for the purpose of His identification with His Father’s perfect and good will in the matter of salvation, redemption, penal substitution. In essence the Lord was illustrating the Father’s plan of redemption – death, burial, and resurrection of His sinless Son – and His willing obedience to His Father’s plan. This is of utmost importance for us to grasp because it gives us a clearer and deeper understanding of the work of the Lord Jesus in securing our salvation through living His life perfectly by faith under the loving Lordship of His Father. Contrary to what many believe and teach, the Lord Jesus did not strategize by leaning on His own understanding and did not utilize His equality with God in His ministry but rather trusted the Father with all His heart and therefore He is the author and perfecter of faith (see Hebrews 12:2). As to the Lord not strategizing by leaning on His own understanding and not utilizing His equality with God we read, “Truly, truly, I say to you, the Son can do nothing of Himself, unless it is something He sees the Father doing, for whatever the Father does, these things the Son also does in like manner” (John 5:19). We also read this about the Lord, “Have this attitude in yourselves which was also in Christ Jesus, who although He existed in the form of God, did not regard equality with God a thing to be grasped (literally utilized or asserted)” (Philippians 2:5-6). It was after the baptism of Jesus which was His public identification of His willing obedience to His Father’s will that the Lord was tempted in the wilderness by the devil. Those temptations were designed by the devil to get the Lord to take matters into His own hands rather than trusting His Father with all His heart; to get Him to utilize His equality with God by exerting His own power; and to get Him to strategize by leaning on His own understanding. The temptations were designed to divert the Lord from His willing obedience to His Father’s plan of redemption in which the Lord identified and illustrated in His baptism – and with this the Father was well-pleased (Matthew 3:17). Good Point. 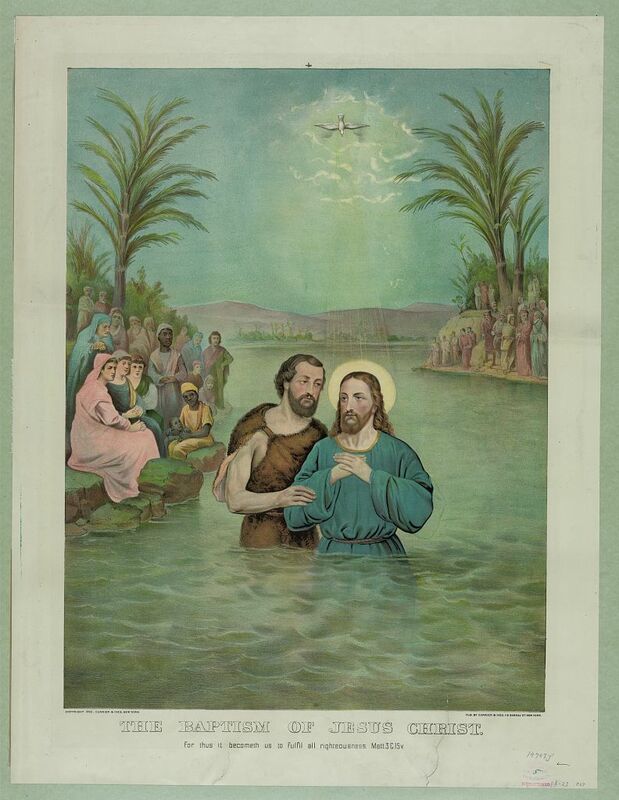 I think it is also possible that Jesus was validating the message of John the Baptist. What is often overlooked is the fact that John the Baptist conception was also announced by the same angel as Jesus (Gabriel), his birth was a miracle (parents age), and was preceeded by a sign from God (Zachariah's being mute). John's ministry was to prepare the way of the Lord. As Jesus began his ministry he more often than not referred to himself as the "Son of Man", not the "Son of God". Jesus actually refered to himself as the "Son of Man" after Peter said he was the "The Christ of God". Why did Jesus do this? I think at least part of the reason is the same as why he submitted to John's Baptism. Jesus was establishing his humanity. For the penal substitution to be valid Jesus' humanity was as important as any other aspect. Also, it is important to remember that the first challenges to who Jesus was after he ascended was the challenge to his being fully human, not his deity. isaiah6:8: For the penal substitution to be valid Jesus' humanity was as important as any other aspect. Also, it is important to remember that the first challenges to who Jesus was after he ascended was the challenge to his being fully human, not his deity. Great point! I was hoping to make it plain that Jesus' ministry while in flesh and blood was by faith and was necessary for penal substitution. This in no way diminishes His deity but is exactly what Philippians 2:5-11 is speaking of. Emptying Himself and taking the form of a bondservant without asserting or utilizing His equality with God certainly established the humanity of Jesus and His baptism only served to validate and establish this fact even further.